Brand identity design, strategy and website design for a favorite California museum. Rebranding the Pasadena Museum of California Art was a dream come true. As a member, and a resident of Pasadena for four years, I was already a fan of the small, ever-changing museum. What's the best about PMCA are the exhibitions: with three exhibition spaces, there is no permanent collection within their walls. Each show highlights a California artist, a wide net that strings together exhibitions from contemporary artists to mid-century furniture designers to landscape artists of the early 20th century. We loved the idea of having a customizable logo that could change and reinvent itself, just like the museum it would brand. We created a logo stencil that would frame artwork from current exhibitions at PMCA, using macro photography of anything from paintings to photography and sculpture. PMCA's designers have appropriated our logo onto their collateral, using our brand cohesively in a way that wasn't achieved before. 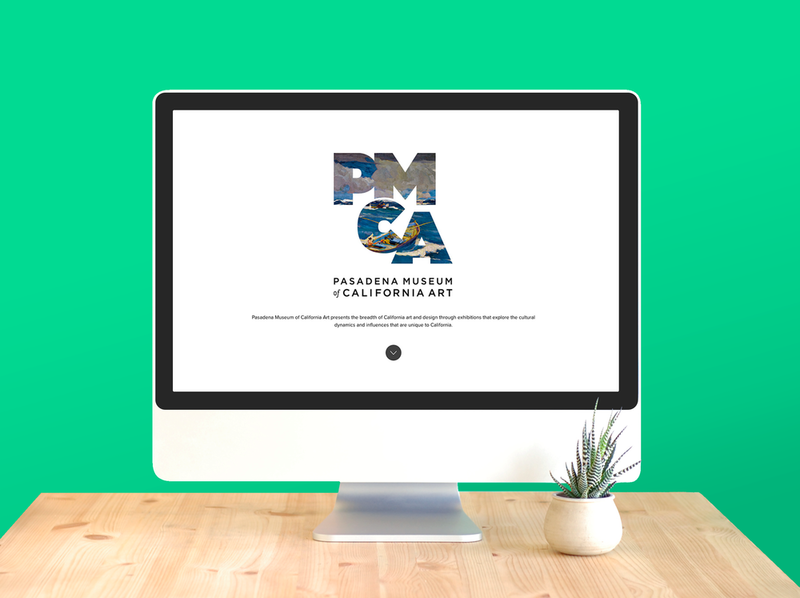 We saw a new, fresh website as a way for PMCA to showcase their amazing exhibitions. We designed the detail pages and homepage to have large, full-width photos, and interior pages with a photographic header behind a cropped version of the logo. We wanted the site to still be accessible for the largely older demographic, while still attractive to younger potential visitors and members. View the full case study on our website, verynice.co. Or, read more about the project and an interview with Alexis Kaneshiro, on the verynice blog.